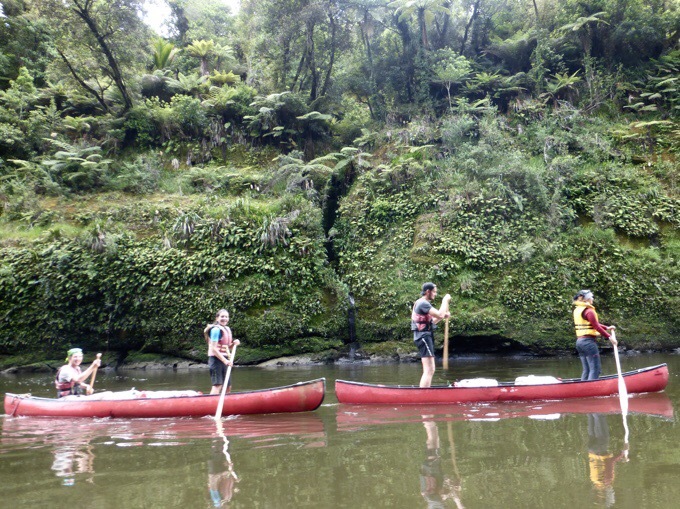 Since today was a short day of paddling, the group had a relaxed morning and set off around 9am. I had crashed pretty early last night, so I was happy to have time to do blogging this morning. Since guys have more muscle to power the canoes, and Becky and I were one of the few pairs without a guy, Frits and Heartbreaker offered to pair up with each of us to make our day easier. Worked out great for Becky and me! Becky rode with Frits, so out two trail babies were leaving the nest. We joked that Heartbreaker and I were the parents watching our children leave home and set off on their own. Of course Becky had to comment that it was more like the grandparents saying farewell since we are the two oldest in the group. How did this happen that I’m the oldest in groups now!? Our trail babies leaving the nest! I was in the front for the first time and Heartbreaker was in the back for the first time, so it took us the first few mini rapids to get it figured out so we didn’t turn in a circle. Once we got it figured out, we had a good routine going and did well. 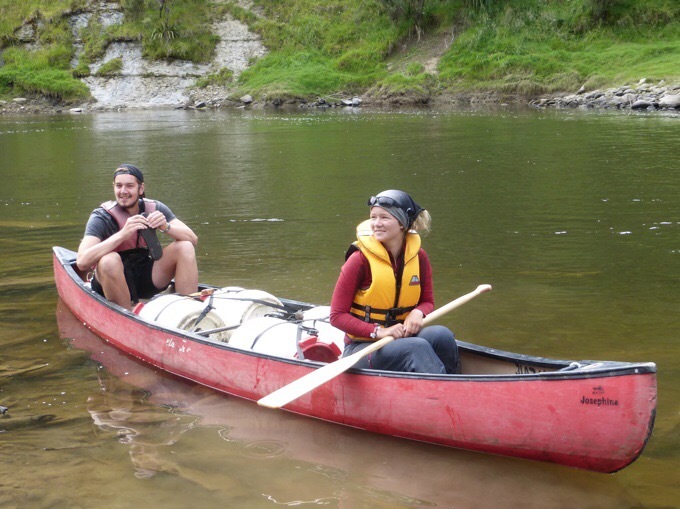 The canoe definitely goes a lot quicker with more muscle paddling in the back and the switch was great for both Becky and me. Heartbreaker and me celebrating that we didn’t flip over. 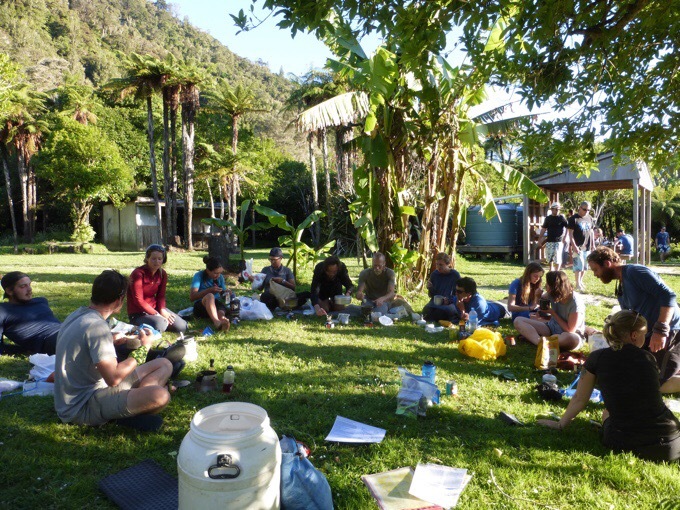 It was a very relaxed day, so the whole group had fun taking it easy. We have 16 in our group, and there are 12 of us that pretty much stuck together all day. The other two pairs are more independent and met us at camp. It’s pretty unique to have this size of group that works well together. We won’t all hike together after this section, and will naturally spread out, but for this river section, since we have the same campsites, everyone is content to stick around one another and have breaks together. 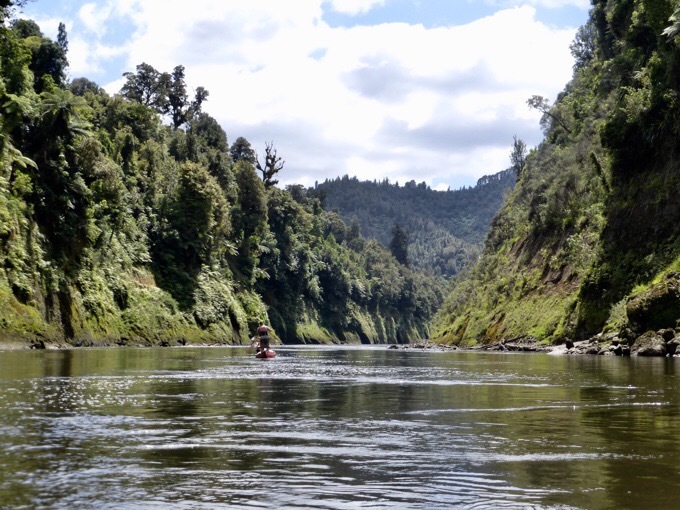 We only had 18mi/29km of paddling to do, which would be about 5hrs for us, but we also had a side hike along the way to a site called The Bridge To Nowhere, so that is why we had a shorter day of paddling planned. 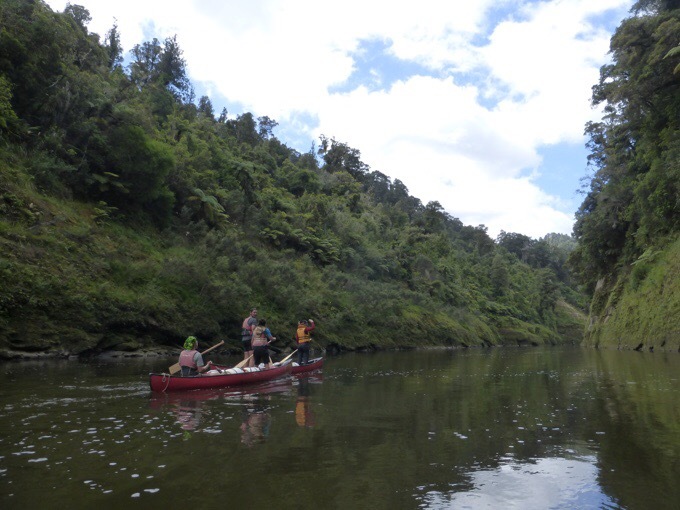 Since we were in no hurry, we had many times when multiple canoes had fun just linking together and laying out while the river did all the work. There were many songs sung as well. In two different situations, someone sang the line “Just around the river bend.” from the Colors of Wind song in Disney’s Pocahontas, and that song has been stuck in my head all day. 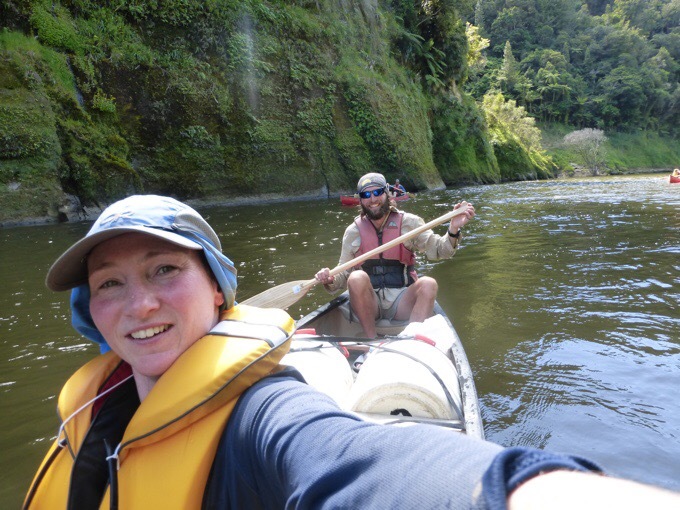 We couldn’t believe we were just laying there and accomplishing forward movement on the Te Araroa. 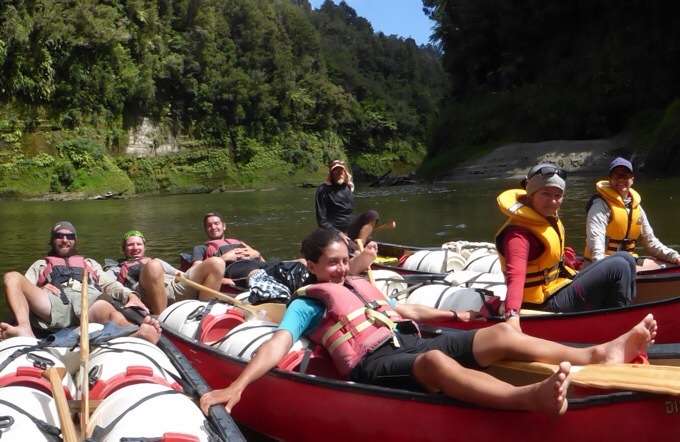 We even had fun doing some small rapids as a group all linked together. 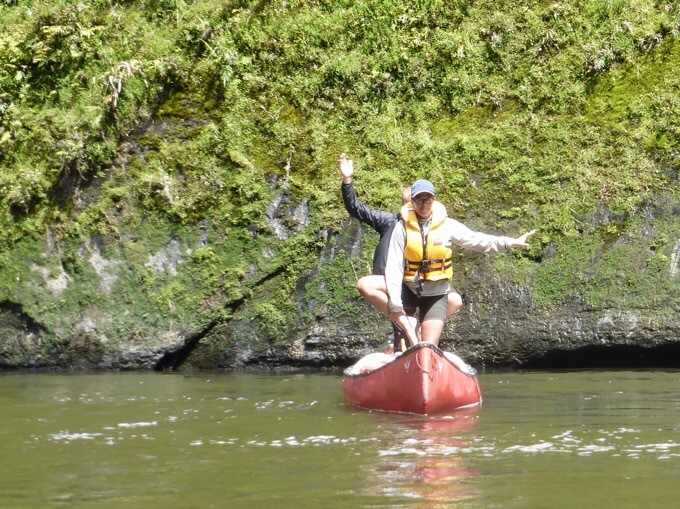 It’s only day two, but people are already comfortable enough to try little tricks like standing up on both calm and more choppy water or trying to balance some yoga moves while on the canoe. I’m content to stay seated as water isn’t my most comfortable place. It’s entertaining to watch though! Matt and Laurel attempting yoga on the canoe. Vittoria, Frits, and Becky standing while paddling. Around lunch, we hit the side hike to The Bridge To Nowhere. It was about a 40min hike up to the bridge. A few of us stayed back to eat lunch before the hike up, and the rest of the group went on up before lunch. 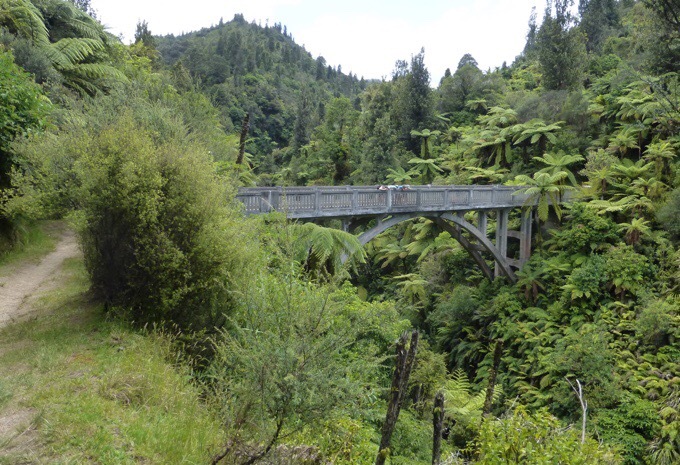 It’s basically a bridge in the middle of nowhere that was built in 1932 back where there was an attempt to really make this area a destination to live and build a future. Unfortunately, due to the unstable terrain, the promises of livable land was not fulfilled and now the bridge just leads to nowhere. 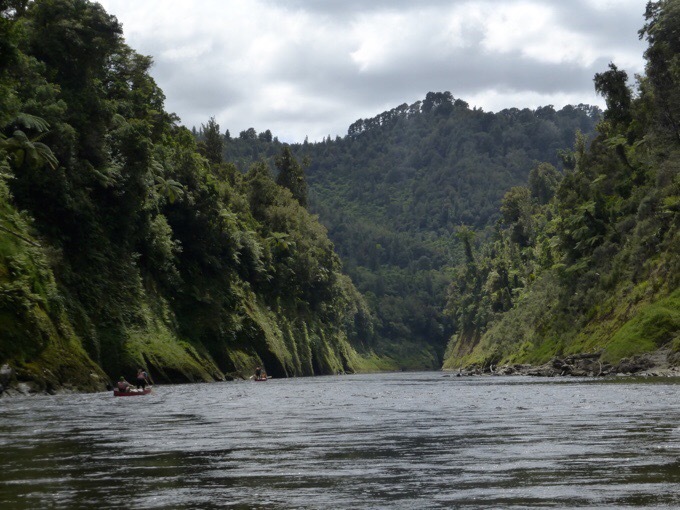 After the side hike, the crew paddled downstream a bit and had lunch on a rocky sandbar. 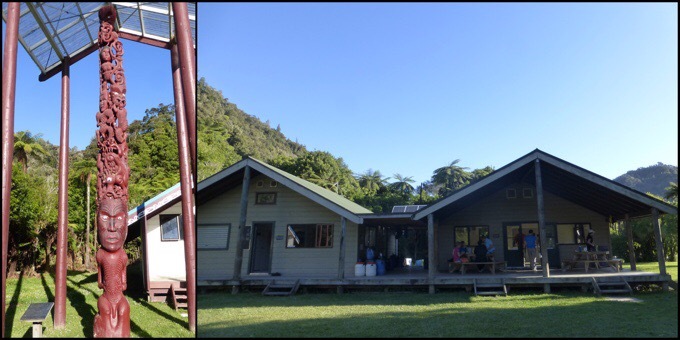 It was just another hour or two to camping at Tieke Marae after that. 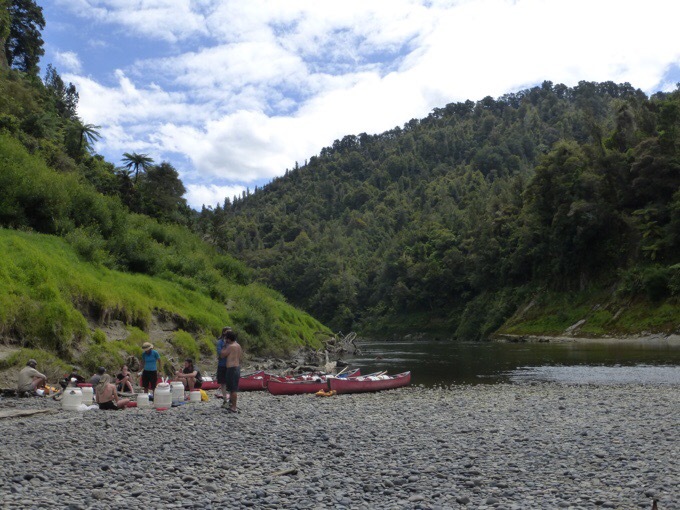 We arrived around 5pm to the unique campsite that is shared by both the DOC and the native iwi that have been on this land for decades. 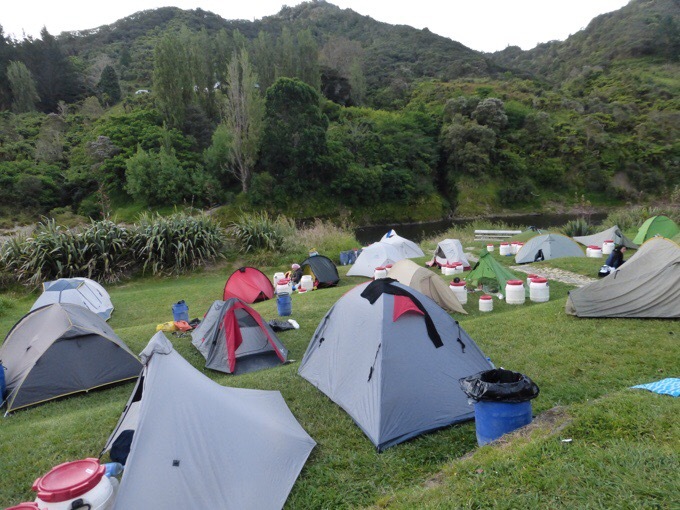 The campsite supervisor was iwi and there is a traditional ceremony and greeting that is done each night out of respect and also as an educational understanding of this area and the cultural significance. I had envisioned something more tribal like a dance or song, but it was more low key with just the camp supervisor and his two daughters. He did a greeting in his language and a song with his daughters. Then he asked for groups to do the same from various countries. The kiwis present did their anthem in Maori, and the French also sang their national anthem. It was cool to see the pride of those groups as they sang songs dear to their country. 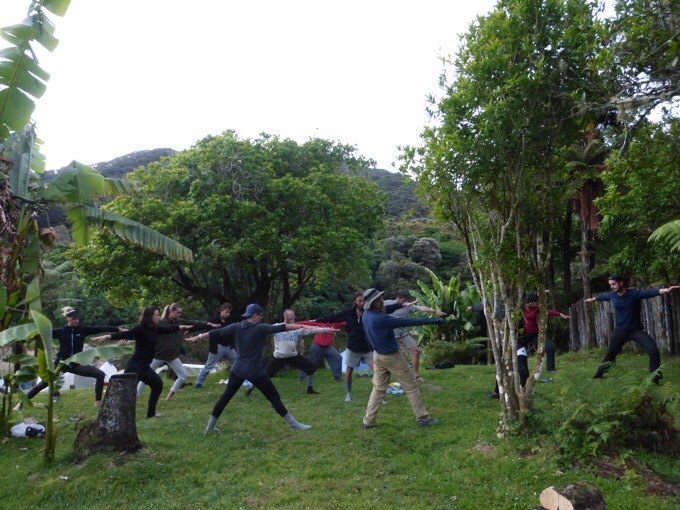 Our group of hikers were lumped into one, so ours was a bit sillier and was a fun children’s song and dance that this group has been doing and has fun with. Some of you may be familiar with the song that includes the line “Peel, banana. Peel, peel, banana.” It’s a fun one and this group is good at it. Laurel then led anyone that was interested in a yoga session, and some of the other campers that are not TA hikers joined in. It was pretty late, so I worked on blog stuff instead, but it’s great to have that positivity going on. I feel very fortunate to be with such a great group of positive people. It was such a relaxing day today, that I was groggy much of the day. I can’t tell if it’s maybe some motion sickness from the water, or taking such a relaxed pace, or being around a larger group, but I was groggy yesterday and today. It’s probably a combination of all of them, but now it’s almost 11pm and I’m wide awake. I was drained yesterday, groggy today, and now wide awake tonight. I’m all over the place and can’t figure it out, but I’m having an enjoyable time and am happy to be with a great group on the river. It seens your group has what it takes to make this oart of the trip more magic. Am I seeing a spark between your trail babies, or is it just overactive imagination? I am definitely NOT one who normally pushes people in this area and am not noiw, just wondering.. Thanks for another adventurous post Wired. The crowds definitely get to me as well but the fun you all have with each other is priceless. On another note, we have a “Bridge to Nowhere” here in So Calif. that is very much like the one you just visited but without all that Amazing green. Google it. P.S. 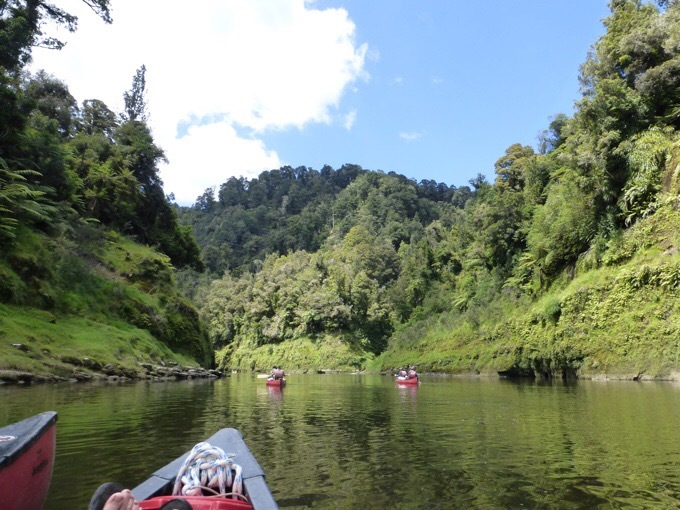 Standing up in a canoe can be dangerous yet is also part of this adventure were on. Have A Merry Christmas!!! It’s funny you are the oldest! I wish I could be there then you could loose that weight off your shoulders. ha. For me, I don’t really care about the age, I just like being in the company of others who enjoy the outdoors. Sounds like you are having fun. Glad you have your dorky hat. I’ve found that when I kayak in Texas with my buddy it is better to just cover up. Got the tops of my legs burned even with sun block on. So no more paddling with bare legs. Hope Becky came out of that alright. Becky looks to be pretty well protected in the photos. I do remember canoeing at Girl Scout camp in Michigan.. the sunburn, the mosquitos. 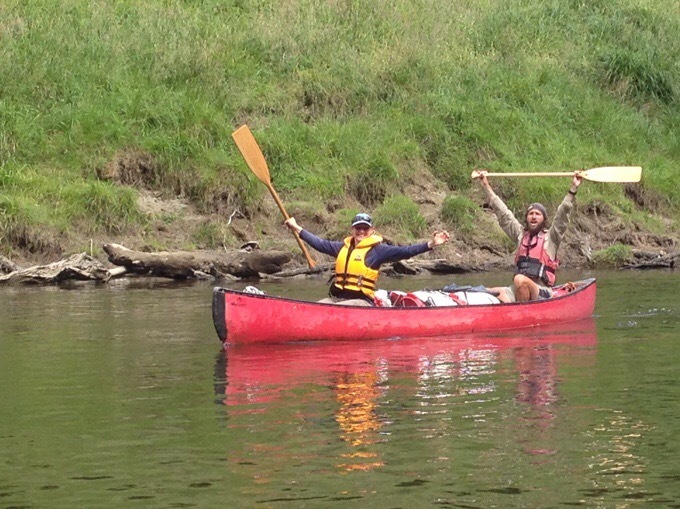 We had to prove we could tip over, right the canoe and get back in, bail and paddle. It was delicious on those hot and humid days. “Heartbreaker and me celebrating that we didn’t flip over.” Love this! Made me laugh out loud! 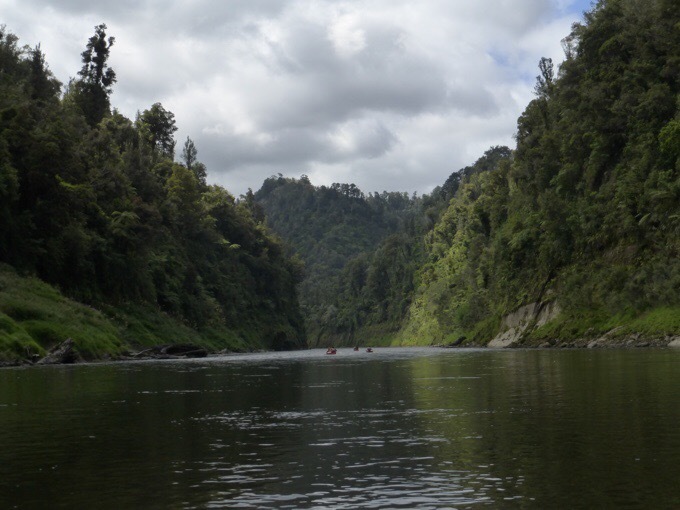 The river pictures are so pretty it’s making me wonder how I can swing a trip to New Zealand!